Catharina-Amalia, Princess of Orange (Dutch: [kaːtaːˈrinaː ʔaːˈmaːlijaː] ; Catharina-Amalia Beatrix Carmen Victoria; born 7 December 2003) is the heir apparent to the throne of the Kingdom of the Netherlands, consisting of the countries of the Netherlands, Curaçao, Aruba, and Sint Maarten. Princess Catharina-Amalia is the eldest child of King Willem-Alexander and Queen Máxima. She became heir apparent when her father ascended the throne on 30 April 2013. Herman Diederik Tjeenk Willink is a retired Dutch politician of the Labour Party (PvdA). Jorge Horacio Zorreguieta Stefanini was an Argentine politician who served as Minister of Agriculture in the regime of General Jorge Rafael Videla. Zorreguieta was the father of Queen Máxima of the Netherlands. Through her paternal grandfather, a member of the House of Amsberg, Catharina-Amalia is descended from families of the lower German nobility, and through her paternal grandmother, from several royal German/Dutch families such as the House of Lippe, Mecklenburg-Schwerin, the House of Orange-Nassau, Waldeck and Pyrmont, and the House of Hohenzollern. 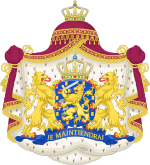 She is descended from the first King of the Netherlands, William I of the Netherlands, who was also a ruler in Luxembourg and several German states, and all subsequent Dutch monarchs. Princess Laurentien of the Netherlands is the wife of Prince Constantijn and sister-in-law of King Willem-Alexander and Queen Máxima. Princess Margarita Maria Beatriz of Bourbon-Parma, Countess of Colorno, is the eldest daughter of Princess Irene of the Netherlands and Carlos Hugo, Duke of Parma, and is member of the Royal and Ducal House of Bourbon-Parma, as well of the Dutch Royal Family. 1 2 "Newly-born Princess Catharina-Amalia second in line for Dutch throne". ↑ "Dutch celebrate royal baby birth". BBC News. 8 December 2003. Retrieved 31 December 2015. ↑ A new government and Dutch troops go to Iraq Archived 4 December 2013 at the Wayback Machine , Museum of National History. Retrieved on 2013-05-06. ↑ Princess Catharina-Amalia, Dutch Royal House, 2013. Retrieved on 2013-05-06. ↑ "Joyful christening of Catharina-Amalia". www.helloonline.com. ↑ "Huis ten Bosch Palace". Royal House. Archived from the original on 17 October 2013. Retrieved 17 August 2013. ↑ "Princess Amalia to attend state school" (in Dutch). DutchNews. 18 September 2007. Retrieved 29 January 2013. ↑ "Amalia gaat naar Sorghvliet-gymnasium" [Amalia goes to Sorghvliet Gymnasium]. RTL Nieuws (in Dutch). 20 March 2015. ↑ "Prinses Amalia naar de middelbare school". NOS (in Dutch). 24 August 2015. ↑ "Princess Amalia celebrates sixth birthday" (in Dutch). DutchNews. 7 December 2009. Retrieved 29 January 2013. ↑ "The children of King Willem-Alexander and Queen Máxima" . Retrieved 4 February 2015. ↑ "Princess Amalia turns seven" (in Dutch). DutchNews. 7 December 2010. Retrieved 8 March 2017. ↑ "Voorzitterschap Raad van State" (in Dutch). Royal House. 28 January 2013. Archived from the original on 24 August 2013. Retrieved 17 August 2013. 1 2 3 "Titels leden Koninklijke Familie". The Royal House. Retrieved 26 May 2017. 1 2 3 4 (in Dutch) Wapens van leden van het Koninklijk Huis, Dutch Royal House. Retrieved on 2013-05-06. ↑ Calvo, Lucio Ricardo Pérez (1 July 2018). "Genealogías argentinas". L.R. Pérez Calvo – via Google Books. ↑ Guerrero, Gonzalo Alvarez; Ferrari, Soledad (1 April 2013). "Máxima (Edición Actualizada): Una historia real". Penguin Random House Grupo Editorial Argentina – via Google Books. ↑ "Ancestors of Máxima Zorreguieta Cerruti". heinbruins.nl. Wikimedia Commons has media related to Catharina-Amalia, Princess of Orange .